Which Type of Seed Ball? How many seeds in a seed ball? How big are seed balls? Monarchs LOVE Swamp Milkweed (Aslcepias incarnata) if you have rich soil and moderate to wet conditions, this is the one to grow! You’ve read about the plight of the Monarch Butterfly and are ready to support this regal species by including Milkweed in your garden. But when is best to plant it? What does it look like? When will it flower? We provide US native milkweed all over the country to people in urban centers, and deep in the countryside, of all ages and walks of life. In doing so, I have run into a great deal of misconceptions. 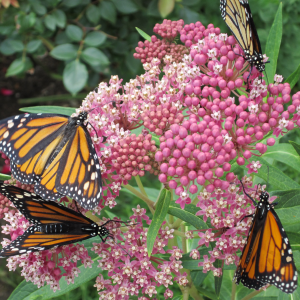 A deeper understanding of the life cycle of the plant can help your milkweed patch become a booming hub of beautiful and unusual pollinators, including the Monarch Butterfly! Asclepias syriaca, Common Milkweed, ready to disperse seeds. A perfect time to harvest the seeds. When milkweed goes to seed in the Fall, the seeds take aloft on their down, and finally land, working their way to the soil surface during the rains of the Fall. And there the seed will rest, and not germinate until Spring. Even if there is a warm spell. Why? To keep it safe during the Winter. If it germinates in the fall, and the seedling is very young, small and tender when the freezes do come, the tender roots will not survive. How does it do this? There are enzymes in the papery seed coat that inhibit germination. That enzyme breaks down over the Winter, and the seed can grow at last, in the Spring when temperatures are sufficient. Germinating in the Spring, it has all Summer to establish roots. Tip: when pods are approaching full size, but still green, tie a rubber band or string around them. They won’t open up and get everywhere! Mark the plants and be certain to return. It’s no good to bind the seeds, and then not harvest them. Harvest when the pods look mottled brown and no more milky sap is reaching the pods. Leave at least half the pods for nature to sow in her own ways. Harvesting the seed too soon. The pod should be drying out and beginning to split. The seeds will have edges that appear like dry, dark brown colored paper. Seeds that are too young will appear orangish and translucent on the edges. Planting in the Spring. Only a small percentage of milkweed seeds will break dormancy when planted in the Spring. Southern lines of milkweed and Butterflyweed (Aslcepias tuberosa) seem somewhat more cooperative. Fall is the best time to plant. Planting INDOORS in the Fall. The seeds need to be outside. They are a WILD flower. They generally will not sprout indoors. Planting in a container. Milkweed grows substantial roots in its first year. It will long suffer if grown in a container more than just a fraction of its first year. Get it outside in the Earth, where it belongs. A first year Asclepias incarnata plant (Swamp Milkweed) will have to wait another two years before it’s blushing vivid pink with nectar-rich flowers. The first year the young milkweed builds its roots. Deep sturdy roots that will help it survive drought, floods, and freeing temps. It works so hard, at developing its roots, as a matter of fact, that the lovely tender green leaves that Monarch caterpillars love are quite diminutive, altogether unimpressive. I keep a close eye on first-year plants. Believe it or not, Monarchs can find them! And boy, do their caterpillars eat. A first year plant may not be sufficient to feed a caterpillar. Be braced to transfer the lovely boys and girls to a larger plant, or rear them on harvested milkweed under the safety of your watch. Not recognizing the small plant for what it really is- Milkweed! I have heard back from disappointed customers, that they didn’t see the iconic 4′ tall stems with softball-sized clumps of flowers. When I suggested that they look for more modest plants, they were able to spot their young milkweed growing healthfully among the grasses. Not waiting long enough for germination. Wildflowers evolved any strategies for survival. One of these is a variable germination rate. Suppose there is a drought in the late spring. Early sprouters will perish. The later sprouting seeds will come up and thrive. Butterflyweed is notoriously stubborn, sometimes coming up as late as July! Monarchs readily lay eggs on second year milkweed plants like this Common Milkweed (Asclepias syriaca). Here we go! The plant is now able to produce a considerable amount of foliage. In the case of a thriving larger-leaved variety, maybe enough to feed a Monarch caterpillar! Adult Monarchs will readily find the plant. Scientists still aren’t certain how monarchs recognize milkweed from the air, but once they land on it, chemical sensors (kind of like tastebuds) on the feet of the Monarch recognize the milkweed at once! The plant looks a lot like milkweed now. But it rarely will flower the second year. Being disappointed or thinking that you are doing something wrong is the only issue. Just be patient! Showy Milkweed, Asclepias speciosa produces large stunning flowers its third year. It is native to the American Central Prairies and West. Flowers at last! The third year a mature milkweed plant has developed, it produces large lush foliage, ample flowers, and will serve as a nectar source for adult butterflies and bees, and there is plenty of leaves for the caterpillars. 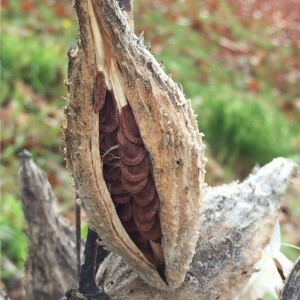 After a long-bloom that can last much of the summer, seed pods will form that open in the fall, starting the cycle anew. You can collect these seeds once the pods have begun to turn brown and open, sowing your own milkweed seeds. Using insecticide to kill aphids. It is important to plant milkweeds that are native to your area. 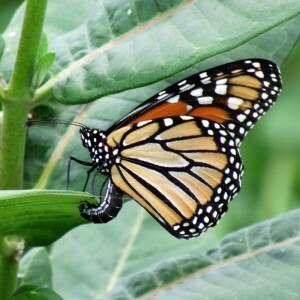 This is for the welfare of the plant and the Monarch Butterflies, who may rely on the species of milkweeds they encounter to navigate on their journey. Below are range maps of the several species of US native milkweed for which we carry Seed balls. There are many additional milkweeds that are also native. Some have restricted ranges, some are endangered or threatened. Most, unfortunately, are next to impossible to purchase seeds for. We have worked hard to find high quality milkweed seed for every part of the continental US. To see current data for ALL US native milkweed ranges, check the Biota of North America Program. They produced the maps, below. Click maps to go see the image and description for the species or to purchase. Thanks so much! We’re happy to provide information about Monarchs and Milkweed! DO MILKWEE SEEDS ONLY LAST SO LONG BEFORE YOU CAN PLANT THEM???? Milkweed seeds can keep a few years if kept cool and dry. Milkweed has optimal germination after one year of storage. Most milkweeds need to endure a cold season before they will grow. How poisonous is the plant? I have 4 tall ones (about 4.5 feet tall) that shot up this year and bloomed. I like them, but I am worried about my small children and German shepherd. Is this plant highly poisonous and what kind of contact would be required to experience negative effects? The children and pets won’t eat them, but may occasionally have skin contact with the plant if left there. Thank you so much for this informative artice. Greatly appreciated! Your maps have no key. Do I buy the recommended variety if I like in the dark green, light green, or yellow area? I assume the tan area is out of range. Otherwise, I have found this site to be very helpful. Dark green is present in the state, bright light green is present in the county, yellow means rare. What is the lifespan of a milkweed plant? What is the span of a milkweed plant? They are a perennial, they come back year after year and spread by roots. Plan on it outliving you! Milkweed can live and spread indefinitely. This is my second year growing from potted nursery plants. Do I cut back the canes or the surface or leave them to grow as they stand? It doesn’t matter whatever you like the look of. The canes will eventually fall off. We have a pre treated Asclepias speciosa, which is native to some parts of California. We also have Asclepias eriocarpa, which does not need stratification. Thank you for this article…it really helped solve some of the mysteries in my milkweed garden! You’re welcome! Thanks for reading it! I purchased Asclepias curassavica and live in del Mar CA. From nursery and they have little green buds in the leaves. About 10 inches tall with 3 different stems. 2. Should I separated the stems? 3. How old do you suspect it to be? Asclepias curassavica is not a US native milkweed. It attracts monarchs so densely that it can spread the infectious OE disease that is killing Monarchs in the south. We never recommend this plant for Monarchs. Please consider replacing the tropical milkweed with native California species that are now available like Asclepias fascicularis and Asclepias eriocarpa. How long does swamp milkweed live? Swamp milkweed is a perennial, and will return every year if the conditions are suitable. This is my second year in attempting to grow milkweed here in Northern California. This year some of my plants are at least 72″ tall. My question is do I need to water them to extend the growing season? Also last fall I was walking along tha Trinity River and found myself surrounded by Monarchs and low and behold I was also in an area covered with Milkweed. We spend our summers about three miles upriver and have never seen even one Monarch in the area. I hope that you can help with my watering question. What does waiting moderation mean? I water in moderation or waiting in moderation. To water in moderation is to keep moist but not wet. The soil should not appear shiny once the water is absorbed. Did you find a typo in our article? Let me know, I’ll fix it right away! 7′ tall! Wow, do you know what species they are? We recommend letting nature determine the watering for native wildflowers. In areas with annual dry cycles, the plants native to that area are adapted with deeper roots, and periods of dormancy. Mine are that tall, too, in Michigan. I wasn’t sure if milkweed was a perennial or just came back with the seeds. Now I know and am moving all baby plants I find to an area where I would like them to grow. I will leave the 3rd year ones (they all have flowers) until the babies are established. My daughter likes to raise the butterflies. 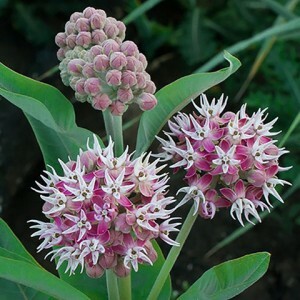 Hi, I just ordered and received the Green Antelope Horn Milkweed and the Woolypod Milkweed seedballs. I live in Austin, TX and it is already starting to heat up. Can I plant now? Should I put the seedballs in the refrigerator first? If so, how long should I keep them there? Will they have flowers this year? I love my tropical milkweed and it was covered w/ blossoms and butterflies all last fall. It was spectacular! I am hoping to introduce some different types of milkweed and could use your advice. Thank you! Hi Amy, We recommend planting these species only in the Fall to mid winter. The seed balls tend to mold if put in the fridge. You can certainly try, but both species are for fall planting. In Springtime in Texas, I recommend our Spring Planting Butterflyweed (Asclepias tuberosa) for Spring planting. We are on our second year if a couple of milkweed plants. Suprisingly they came back. I didn’t see flowering, but was pleased to see a few fat catepillers last year and hope to see more this year. What I did not see were pods. Was I supposed to see them on a first year plant? I really want to grow more from seed and the two plants I have are coming back in force. Milkweed comes back year after year in good conditions. It is a perennial, so it should come back. Flowering doesn’t occur until the second or third year, and only after flowering will you get pods. Monarch caterpillars eat the leaves, so you can see them the first year. My Asclepias Syriaca (common Milkweed)won’t bloom after 3 years? The plants are growing large and lush and multiplying beautifully, but will not bloom for some reason. I live in Atlanta, Ga. I suspect that it may be receiving too much nitrogen, which encourages leaf growth, but often reduces blooms. If the plants were stressed, that could be a reason, but they seem to be doing well. If you are fertilizing, cut back on that. Nitrogen eventually will be lost from the soil and they will bloom. Monarchs don’t need the flowers to reproduce, so keep your eye out for caterpillars! It will prefer a sunny location. Break it in gradually to the outdoors. Introduce it to shade on mild days. Shelter from wind, and be certain it is well watered. Gradually increase the exposure that it receives for two weeks, then plant it in a sunny location, keeping moist for a month while the roots connect with the native soil. I planted 4 plants in April and in June the monarch caterpillars ate then down. There are hardly any leaves left. Will they come back this year. I am in central Florida. Great news that you are feeding the Monarchs! Yes, the plants will come back next year. Co-evolution is beneficial to both species in this case. Congrats on helping this year’s generation of Monarchs! Most milkweed needs to be planted in the Fall. Some might come up in the spring. Some might perish. Hard to say. Milkweed does not transplant well. If you must, do it in late fall, after it has gone to seed and died back. Dig up as much of the root system as possible, and plant in well, draining soil in a sunny location. Common Milkweed rhizomes are long and horizontal. Plant about 4″ deep and tamp the soil down well. Monarchs lay eggs on the leaves of milkweed as they migrate North. Typically, they do this on second year and older plants, as they are taller and easier to find. Also have more leaves for the caterpillars, who eat a lot! I live in South Carolina (zone 7/8) what is the best time of the year to plant milk weed?? Best time to plant would be October/Novemeber. Do I need to be concerned about deer eating milkweed? I have seeds to plant but deer frequent the area I planned to plant. Deer won’t like the taste of it and will avoid it. Very bitter and somewhat poisonous if eaten in quantity. I have second year plants in the Chicago area that are very tall and have pods. I haven’t seen any Monarchs yet. Is it too late for them to feed and lay eggs? I just noticed this morning that there’s at least six monarch caterpillar’s on the milkweed! All but one are pretty big, two were eating the pods instead of the leaves. The pods are green and closed, I had no idea that they eat those too. I took some photo’s but can’t post them here. Several things can cause a perennial to die. Milkweed is notoriously hardy, but changes in climate can send it reeling. So can salts from roads, and also changes in hydrology. If a ditch drains differently or a new driveway sheds water in a different direction, plant roots can’t always adapt to the change. You might try collecting some seed pods this fall from local plants that are thriving. Plant some new ones among the older plants. Maybe they will grow to the current conditions and fare better. My milkweed just showed up two years ago. Reminds me of growing up in Ontario Canada. We always blew the pod seeds in the air in the fall. Monarchs all over my property now. Gonna see the fence line between properties this fall. I think it is a lovely plant, too. I also adore the heady floral aroma when it is in full bloom! This is my first season growing milkweeds. I planted the small plants that I purchased at a sale and they are huge and blossoming. I have lots of butterflies and have had about 8 caterpillars. I haven’t spotted any monarch eggs, however. Aphids tend to colonize milkweed when it is stressed. Too much water, too little water, too cold, too warm, etc. Plants will bounce back the following seasons when conditions are fine. 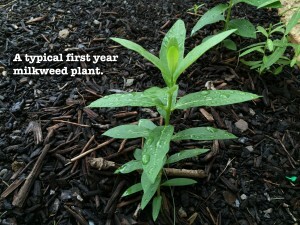 It may be possible that the milkweed was planted in less than ideal soil or sun. If you have caterpillars, you probably have eggs. The eggs are extremely tiny, usually occurring in the middle of the underside of each leaf. I don’t see milky sap when I cut leaves off my milkweed plant. Is there something wrong? You may have Asclepias tuberosa. It has orange flowers and does not have milky sap, although it is a Monarch host. It is possible that you don’t have milkweed, also. All of a sudden lots of monarch caterpillars. Very excited. Took five in to raise for my grandchildren to experience feeding them etc. lots of fun. Also saving them from the town grass cutter. Milkweed should be kept outside in the winter in the soil, not in pots. If it is tropical milkweed (orange/yellow/red) you should not grow it as it poses problems for monarch migration and mite transmission. If it is A tuberosa (just plain orange, one tone of color) it is native to your state, and it will come back in the spring if left outside. Based on the regions given, I suspect that you have tropical milkweed, and I strongly recommend that you dispose of it as it does more harm than good. Go for native milkweeds to NY like Common Milkweed, Butterflyweed, and Swamp Milkweed. All lovely. This was an extremely helpful article, thank you! I bought nursery plants and they bloomed in Year one. We never saw a monarch, but the patch did host about 20 caterpillars, so they must have found the plants. I left town for two weeks when the caterpillars were at their height, and returned to no caterpillars, no pupae and no Monarchs. Must have missed the show! but I was delighted with the plants, as were others in the neighborhood, and we look forward to Year Two. Excellent! Our naturalist has observed that monarch caterpillars tend to wander away from the milkweed patch a few yards to pupate. The chrysales are quite hard to spot! The milkweed will be back again and again, so enjoy! In N.E. Ohio some of our milkweed plants have produced flowers but not pods? Some flowers, when present, have appeared dried out and did not produce pods. Will deer eat the flowers? What are the possible causes of failure of a mature plant to produce pods? Milkweed is a difficult plant for pollinators to pollinate. Sometimes you will seed bees and butterflies, but no pods will be produced. Some species are going extinct because their select pollinators are so scarce! Is a pod a long green tubular growth at the end of a stem and is tight feeling? I don’t know what to do with these pods that have developed. Leave them alone or cut them off or open them?? My milkweed plant has orange clusters of little flowers and has been beautiful this year. THis is the 2nd year for it. Last year it bloomed very little and I did not have these pods at all. Wait for the pods to turn yellow and begin to dry. Wear gloves that will protect your hands from any residual sap that is present. Ideally the pods will just be beginning to split. Check the seeds before removing the pod by opening the pod a wee bit. The seeds should be dark brown and papery. If they are green or orange and not very dry looking, they are not ready. Place the pods in a paper bag and put in a dry place. They will open up on their own. At that point, you can transfer the fluffy mess into a sealed clear plastic bag and work the seeds off the fluff. Cut a small hole in the lower corner of the bag and shake the cleaned seeds out. How many caterpillars can one 3′ to 4′ plant support? My weeds have been eaten bare and I actually made an “emergency” run to a local nursery for several potted plants. I don’t think it’s going to be enough. A couple to maturity. They have a huge appetite! I didn’t see this habitat map until I had already ordered some Narrow-Leaf Milkweed Seedballs. They are native to the west coast, but I live in NJ. The packet said they would be okay in zone 6A, where I live. Will they grow here? When and where did you place your order? If recently, we can cancel your order. You can always return the seed balls to us. Hi-I found a monarch caterpillar on my walk today. Where I live (Reno, NV), the milkweek has already started dying back and seed pods have started spewing seeds. Is my catepillar doomed? Any suggestions? It is getting late in the season. If there is any green milwkeed, move it to those plants. If he is very large, you might offer him some sliced cucumber or pumpkin. 5th instar monarchs have reportedly been able to digest those and will eat it if hungry. If it is large, it may not need food, maybe it is close to pupating. All the best and thanks for looking out for the little ones! Thanks for the quick reply. I will head out tomorrow and see if I can find some green milkweed but it might be hard to find, as we have already had multiple hard freezes already. I will do the pumpkin and cucumber. He doesn’t appear to be at the 5th instar stage but maybe. Should I put him in a jar with a lid and see if I can get him to pupate? I thought they make a chrsyllis and don’t pupate? I thought pupating was for under ground like the tomato horn worm. Oh well, I guess I can feed him to my chickens as a last resort, at least he’d become part of the food cycle. Chrysalis is the pupal stage for butterflies, pupa being a more general word than chrysalis. It will only enter that stage if it completes all the instars, so if it is small, it may be doomed. If that breaks your heart, and understandably so, plant some of those milkweed seeds in its honor so more caterpillars make their way in future years. If it is already freezing, it is unlikely that it would be able to mature into a butterfly and make it to the roost this year. the milkweed should come back just fine in the spring. It’s natural for it to lose its leaves and stems as it is a herbaceous perennial. The aphids may or may not return. They tend to do well when the plants are stressed, and with the unusual climactic conditions that we are experiencing throughout the US, they have been seen more often. Don’t use soapy water, as that can also kill the monarch caterpillars. Just let the aphids be. You might try watering the milkweed if dry conditions are an issue. That will help the plant resist the aphids sucking moisture. If you are having plenty of rain, it might be too much, or the temperatures are wrong. Common Milkweed would be great for you, and you can plant it until the end of March. May I use insecticidal soap to kill the large number of oleander aphids on my six 2 year old weeds in VA if I see no other creature on the plants? I figured that with no cats on my little plants, this would be OK. The aphids worry me a bit. How else to remove them? Also, do the cats eat during the day and wander off at night? Thanks. The soap will also kill monarch caterpillars present. I would just leave the aphids. aphids often prefer plants that are not thriving. I would consider whether your plant is in a good place- right moisture conditions and sun. Bouts of unusual weather can also take plants by surprise, and with Climate Change we have seen many stressed plants. Are milkweed stalks super fragile during wind/rainfalls? Last year was the second year for mine and they grew to over 4 ft tall. But when it rained, the weight of the water toppled each plant. I had to stick thin iron poles in the ground and tie them next to them for support. Same thing happened this year (2 days ago) with a night’s worth of rains. Also, oddly some NEW milkweed plants grew nearby my original line of them that I planted. I’m trying to think how that would happen and my only conclusion is that I had some spare milkweed seeds that I must have randomly planted to see if they would take or not. Well, I seem to have doubled my milkweed “crop”…! No signs of any Monarchs though….even with the bright colours of my other nearby perennials in my garden (tall sunflowers, coneflowers [purple, white and now red ones..], red rose bush, hydrangeas, etc…). Great website by the way – I now know and expect to see some pods grow in this 3rd year of their lifecycle..! Milkweed is pretty strong, but it can become toppled in heavy winds or if exposed. For ornamental purposes you are wise to stake plants that are getting ungainly. The new milkweed plants, if they are robust, rather than fine like seedlings, are likely shoots off root runners. This is a method of propagation that common milkweed uses in addition to seeding. Thanks for the kudos on the website. It’s hard to keep up and run the business sometimes. 🙂 Hence the late reply! After caterpilliars much all the leaves off of a young milkweed plant will the leaves grow back? How lonf does it take? It may grow back some that same year, but usually, the plant will return the following year. Mature plants will be more likely to leaf-out again after being mowed by monarchs. This is my first year of hosting monarchs. I live in coastal San Diego. When I bought my milkweeds I asked about aphids and ants. He said to leave them alone and that they were actually good for the butterflies and that the ants keep the aphids rounded up. Is this true? I have lots of eggs and caterpillars. I’ve been raising a few indoors. I don’t think they are ‘good’ for the plants, but killing them will also kill the monarch larvae. Aphids are generally a sign of stressed plants. Hopefully the milkweed you purchased has more favorable conditions than with this grower and the aphids will be less of an issue. How does a milkweed plant grow on its own if we didn’t plant it? That may sound like a silly question! We have a row of rose bushes and have lived here 7 years without any changes in those. About a month ago I noticed an odd weed growing up right between two rose bushes. After closer examination I found four monarch caterpillars feasting on it! Honestly, I didn’t know it was milkweed until researching the caterpillars. I’m just wondering how that would’ve shown up in the middle of our roses all of a sudden. Our whole family is enjoying watching them everyday but we are definitely curious about how we got this plant! How do you harvest Swamp Milkweed seeds to grow? We don’t, but one can. We purchase our seed from a variety of licensed seed producers. Wait until the pods turn yellow and begin to dry out. Outside of house (Palm Beach County, FL) was recently painted, requiring me to cut back my butterfly garden. A few of the older milkweeds survived and hopefully will flower. Thanks for telling me, though, that I have to wait for the third year to really expect seeds from the new ones I just planted. The Monarchs have already denuded some of their leaves, and some they haven’t touched. Thanks for the info. You’re welcome. They do take a long time to establish. Often people assume the seeds didn’t grow because they don’t recognize the first year plants! Hello – I am just beginning to research all of this and appreciate all of the information you have shared, Blake. Is there a way to contain the milkweed area when we plant it in the yard to prevent it spreading, such as in a raised bed? Thank you! Thank you so much! We try to spread quality information through our site. Hearing from folks like you makes it much more fun! Milkweed won’t do well in a raised bed, as it needs those deep roots. I would recommend planting varieties that don’t spread so much as common milkweed. Try A tuberosa (butterflyweed) in the East, and A. fascicularis on in the costal West. If you have moist areas, Swamp milkweed is amazing and is not an aggressive colonizer. Butterflyweed (A. tuberosa) is a perennial. A part of it’s annual cycle is to die back to the roots. It should come back after a few months of dormancy. Northern Italy isn’t a part of it’s native range, but I believe it should be fine as long as it is not an Alpine climate. We only have 1/2 acre and would love to start milkweed along our fence. I really don’t want them to spread to other folks yards. After they bloom and the seeds are dark can I harvest them before they start flying around? Certainly. You can just trim the spent flowerheads off as well. I have a few milkweed plants in my butterfly garden and have watched 8 caterpillars form their chrysalis but the caterpillars have eaten all the leaves on my milkweed. How long will it take for the leaves to grow back as I now have a big ugly bare spot in my garden? Milkweed is used in gardens to attract Monarchs and their caterpillars. Please enjoy the butterflies as they frequent your garden and watching the transformations of the larvae into butterflies. The milkweed will look scraggly after it is eaten, but the environmental benefit is great. Make your own colored seed balls! Sustainably harvested, non-GMO wildflower, native grass, and vegetable seeds balls. Contact us! Grow@Seed-Balls.com. We'd love to hear from you! Free Shipping on orders over $50. Shop now!